A little birdie named Google told me that the Super Bowl is coming up. I don’t know who’s playing, but I do know what I’m bringing to the party—this bright, colorful, super fresh, seafood-free ceviche. Little wedges of juicy grapefruit and orange are remarkably similar to raw seafood in texture and color. 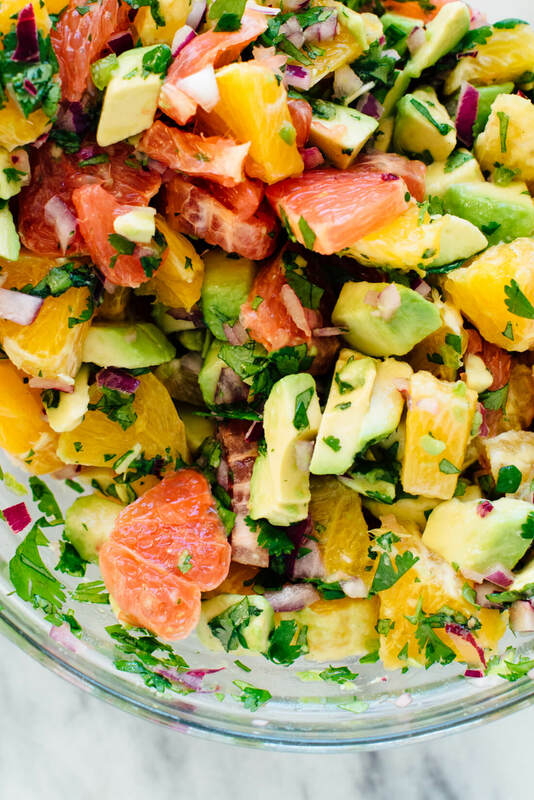 Citrus combined with perfectly ripe diced avocado makes a cheerful party appetizer or dip. It’s healthy, too, and lighter than my favorite guacamole recipe. This “ceviche” is made entirely with fresh produce, so use the best grapefruit, oranges and avocados you can find. Fortunately, it’s citrus season, so you shouldn’t have to look far to find sweet, juicy citrus. Pick avocados that yield a bit to a gentle squeeze, but don’t have any mushy parts. You’re working with fresh produce that can vary a lot in size, so use your best judgement at the store and adjust the final product to taste. I don’t always love grapefruit, but it’s balanced here by rich avocado and sweet orange. If the final result tastes a little too bitter, add another pinch or two of salt, since salt helps cut bitterness. This ceviche is simple to make; you’ll just need a cutting board, sharp knife and serving bowl. The produce preparation is a bit labor intensive, though, so don’t plan on making this in a big hurry. Pour yourself a beer or turn on some tunes and the time will go by quickly. I hope this vegan ceviche is a big hit at your Super Bowl party! As always, please let me know how you like it. If you’re looking for more party inspiration, here’s my full collection of Super Bowl recipes. 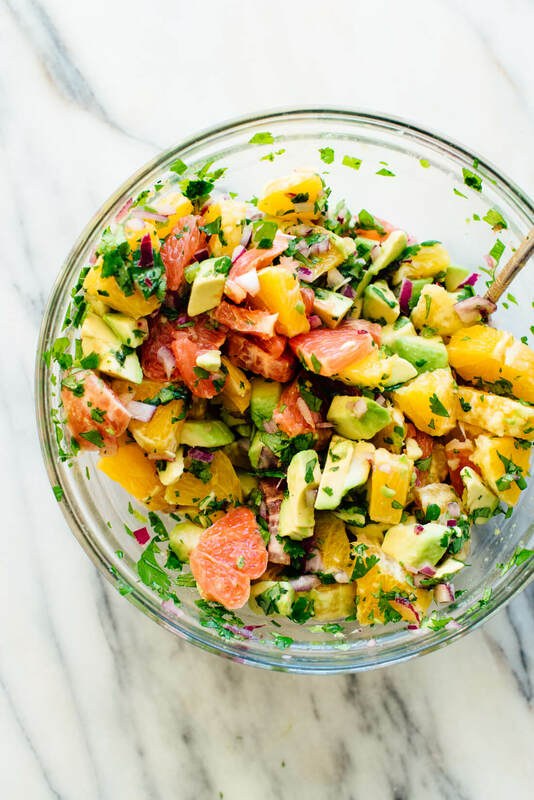 This seafood-free citrus “ceviche” with avocado makes a wonderful appetizer, side salad or party dip! This vegan ceviche is delicious, colorful and healthy. Recipe yields 6 appetizer or small side salad servings. 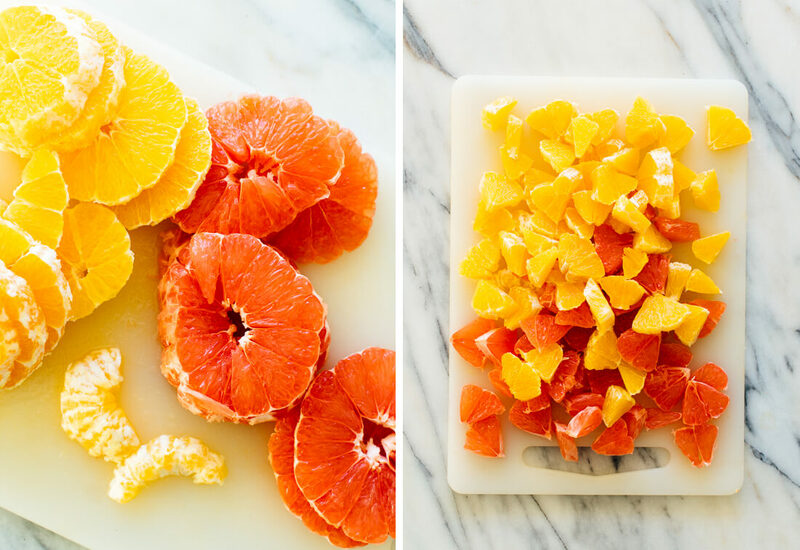 To prepare the citrus: Peel the skin from the grapefruit and oranges. Then slice across the center lines to make ¼″ thick rounds (see photos). Gently tug the rounds apart to make little wedges of fruit, about 2 segments each. 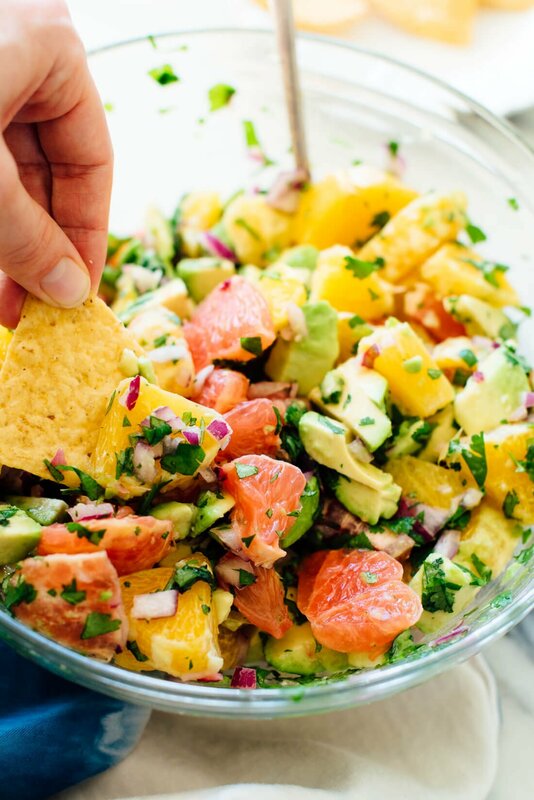 In a medium serving bowl, combine the citrus wedges, avocado, onion, cilantro, jalapeño, lime juice and salt. Gently toss to combine. Adjust to taste—be generous with salt (it helps counteract the bitterness of the grapefruit) and add more lime juice if it needs more citrusy punch. Serve promptly, with tortilla chips on the side if you’d like. 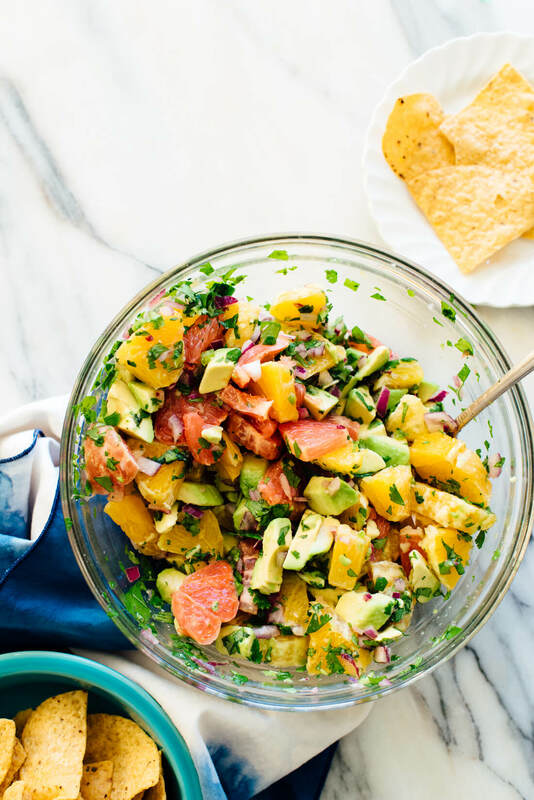 This ceviche is best consumed within a few hours, but there’s enough citrus juice in there to keep the avocado relatively fresh for 1 to 2 days. Store leftovers in the refrigerator, in a Ziploc bag with the air squeezed out to minimize browning. If you love this recipe: Don’t miss my best guacamole recipe and black bean salad recipe. I love the ideaaa of ceviche but never order it ’cause i’m not overly keen on raw fish. This though!!! Ready to dip, top and scoop it up! Thanks Kate! I think I will try this with Pisco Sour Cocktails! Delicious! Thank you, Stacy for the review. I haven’t made it yet, but I’ve already sent a link to my brother, and I’m going to make it very soooooon (will swap in a blood orange I have on my balcony too, for even more colour and juice). Looks and sounds fantastic. Off to get avocados tomorrow. This recipe is perfect for a vegan poke bowl option. Thank you for always giving me new inspiration. Let me know once you try it! I would love to hear what you think. I had something very similar in Costa Rica and it was fabulous! The chef also included hearts of palm and jicama. Thanks for posting this recipe. I can’t wait to make it. Costa Rica is beautiful isn’t it! I would love to hear what you think of this variation. This looks so flavorful and refreshing. Definitely adding this to spring/summer menu plans! It’s really great right now with citrus in season. :) But yes, feels very fresh like spring and summer. Let me now what you think! I’m allergic to avocado :-(. Any substitute? That’s a bummer! Unfortunately, there isn’t a 1-to-1 substitute for avocado. You could always leave it out. Oooh, this looks good. 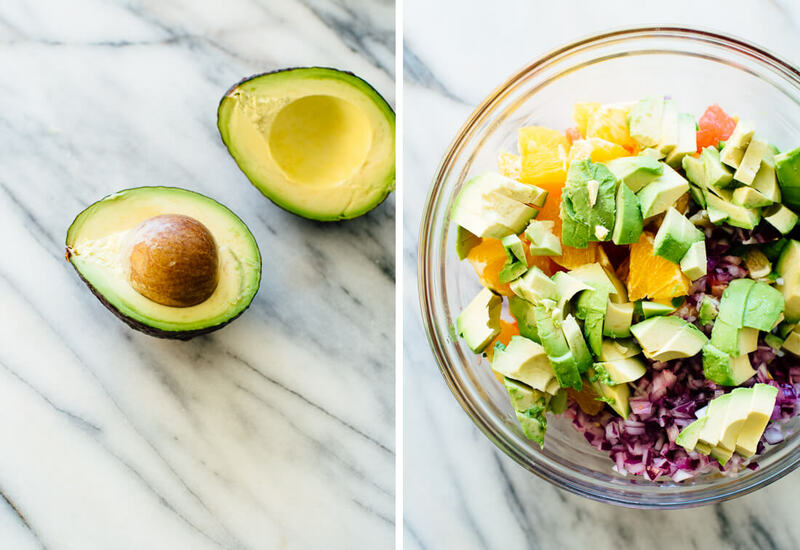 I’m obsessed with citrus and avocado together! I see this lunch in my near future. I see it too! :) Let me know what you think when you try it. I have everything on hand except the jalapeno. Do you have any suggestions for alternatives? I have trouble digesting all peppers, even the mild green bell peppers. But I want the spice. I’m not sure what you mean, Natalie. :) This is a great mix. You can always cut back on the avocado slightly, if you would like. You never cease to impress with how creative your recipes are! :) Can’t wait to try this one out. You’re sweet, Melissa! Thanks so much. Love to hear what you have to think. I don’t love regular ceviche, so this is totally something I can get behind! Mh yummy, that looks amazing. I love citrus fruit and I bet it goes great with the avocado. Yum. Definitely need to give that recipe a try. Hi Kate, love this recipe and so many others. I have your cookbook and have tooled around with almost all of your recipes. I appreciate that everything is loaded with so many great nutrients as well. I am a plant-based eater currently and am trying to eat as healthy as possible. I’m now cutting oil out my diet. 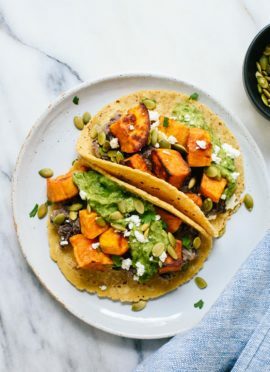 I want to continue to use your recipes for dinner but I was wondering if you could recommend some healthier alternatives to oil in general as all oil (olive, coconut, avocado and all others) tend to raise my cholesterol. I do know that some recommend replacing it with veggie broth. Might you have some further suggestions? Many thanks in advance! I don’t have another suggestion for you outside of what you mentioned if you are looking to cut all oils. Best of luck and let me know how it goes! Looks so so flavorful! 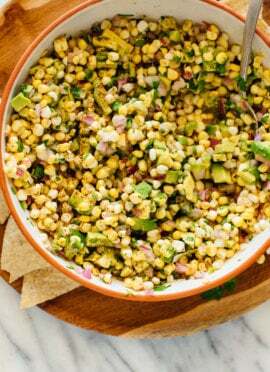 I would love to enjoy this with some corn tortilla chips, on top of a salad, or even just by the spoonful! Let me know what you think when you try it, Cassie! Thanks for following, Ashley! Yes, please let me know how it goes. Wow this is good. Didn’t miss the fish. I know right?! Thank you, Kim for the review! My fiancé was very skeptical of this recipe as I told him what ingredients we needed to prepare. Ultimately this was a delicious and fresh tasting recipe and hit the spot! Passed the test and we will be bringing it to our next family get together. Thank you! It’s a bit different, but SO good! I’m glad he came around. :) Thank you, Liz for the comment and review! I forgot cilantro when I went to the store this afternoon, but made your “ceviche” anyway. Oh my goodness, it is so delicious!! The citrus is bright and lightens the richness of the avocado. Thanks for another great recipe, Kate. I’m so glad you made it, Alison! Thank you, for your review. Just made this for a super bowl party and it was a hit! I love that it has winter produce but is bright and refreshing. This is a great fresh salsa recipe as a side salad or dip. Thanks for all you do Kate, so many of your recipes from your blog and cookbook are family favorites for us. I love that too! Even though it has seasonal produce, makes you feel like it isn’t winter. :) Thank you, Amelia for your support! Made it tonight and my boyfriend and I devoured almost all of it. Sooo good! I plan to eat the leftovers tomorrow in a rice bowl. I went heavier on the salt than what the recipe called for. Thanks for the great, creative recipe! Delicious idea! Thank you, Kara for your review. Made this for a super bowl party and it was a huge hit — all my non-veg friends absolutely loved it. That’s great!! Thank you, Madeline. This is fantastic! All by itself – no chips! My citrus was really juicy so it was a bit soupy but it tastes great! You’re right – don’t forget the salt! It can get juicy as the citrus sits for a little, but I think the flavors come more alive that way. Thank you, Cindy for sharing! It’s so fresh and super good! Hey Kate, is there an alternative to grapefruit? My husband can’t have it (although he loves it). He takes a medication that says he can’t have grapefruit while he’s on it. You can add additional oranges if you would like! Or maybe try a different orange variety. I made the Citrus “ceviche”yesterday prior to attending a heavy, cheese centric meal. My friend asked me to bring an appetizer so ,after searching, I found your seafood- less “ceviche”. the unique, fresh taste and such a healthy , delicious alternative to most hor’ doevres ! One thing I would suggest is that it be made a few hours or even the day prior to serving to better blend the flavors. Such a great find and so creative! I agree with you, Nancy! It’s great when you can let the flavors settle a little bit. Thanks for the comment! Just made this and it’s fantastic! Next time I make it (and there will be a next time for sure! ), I think I’ll add in a good bit more grapefruit. Thank you!! Yes! I say go for it. You might want to increase your other elements or cut back on the orange to make sure all the flavors shine. OK, now I thought this looked good but I wasn’t really certain I would like it. I figured I’d go for it since it had 5 stars. OMG there is a reason. This was SOOOOOOOOOO good! I left my hearts of palm at home :( so I’m not sure how it is with those but I’m sure it’ll be delicious as well. Make this! Everyone I let try it, LOVED it! Ha! It’s a surprise that is for sure. I’m so happy you enjoyed it, Isbelle! Thanks for your review. I love this recipe! I’ve made it for 1 by swapping the orange and grapefruit for a cara cara orange. So yummy. This is so so so good. I made it last year for a super bowl party and it was devoured. Talk about a guilty-free pleasure! It is also great the next day as a snack or a garnish on tacos. Another 10/10 recipe from C & K!!! Thank you, Katie! Since you love this one so much, if you would like to leave a star review I would really appreciate it. This was surprisingly delicious and refeshing, and the color combination very uplifting for a wintry rainy day! My husband who does not usually like raw onions or avocado, really enjoyed it! I forgot to leave a star rating with my previous review. This recipe is excellent! Thanks for coming back to leave a star review, Katie! I do really appreciate it. 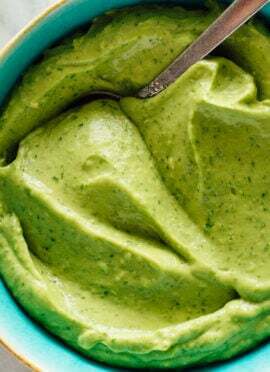 Incredibly refreshing and fragrant, and surprisingly creamy with the avocado. I added a smidge of cumin for flair. I served it alongside grilled chicken, and wow! Such a beautiful compliment. This is a new go-to party dip as well. Thanks for sharing! I’m glad this is a go-to party dip for you. We made this for a superbowl party and used blood oranges. It was a hit! It is refreshing and a perfect match for heavier potluck dishes. The leftovers were great for lunches when paired with a veggie burrito, too. You can eat this dip with a fork as a salad–it’s so good! Sounds delicious, Kathleen! Thanks for your review. Going to try blood orange ceviche using my bumper crop of oranges!